Kauai, Hawaii’s garden island, offers some of the most romantic and scenic landscapes in the world. Whether it be barefoot on a white sandy beach, by a majestic cascading waterfall, or on a seaside bluff overlooking historic Hanalei Bay and famous Bali Hai. 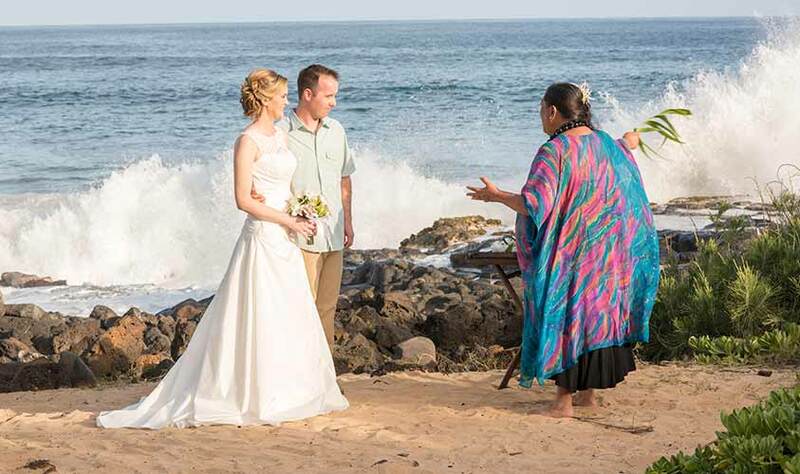 The Island of Kauai offers the most breathtaking wedding locations found anywhere in the world. With perfect weather just about all year round, it’s no wonder Poipu is called “The Sunny South Side.” The southern coastline features a series of unusual reef formations and white sand beaches. The best sunsets in Poipu are in the months of October through March, however you will see beautiful sunset colors throughout the summer months as well. Located on the East side of the island, Kapa'a means solid in Hawaiian and is centrally located just north of Lihue. The town and its beaches are nestled at the base of Nounou Mountain, also known as Sleeping Giant. It is also called the Royal Coconut Coast. Located on the north shore, just south of Princeville, Kilauea is home of the lush Na 'Aina Kai Botanical Gardens. The gardens offer a variety of stunning locations for ceremonies and receptions. The Hardwood Forest offers a fairytale setting with its endless rows of teak and zebrawood trees that frame a couples' day perfectly. Ka'ula Lagoon with its picturesque waterfall creates a backdrop of unrivaled beauty. Na 'Aina Kai is truly one of the most breathtaking venues on the north shore. Kilauea has some of the most exclusive beaches on the north shore. Anini beach stretches out for miles and boasts views of the Kilauea lighthouse and Kalihiwai bay. Located between the towns of Kilauea and Hanalei, Princeville has stunning bluffs and beaches offering breathtaking views of Hanalei Bay and Makana Mountain Ridge, also known as Bali Hai. There are many hidden gems that are worth the search. Hanalei Bay Resort and Pu'u Poa Beach have great sunset views and Bali Hai across the bay. The best months for sunset are April through September. Located on the northern most part of the island, the towns of Hanalei and Ha'ena include some of the most famous and beautiful beaches in the world. Hanalei Bay is a 3 mile crescent moon of pristine white sandy beaches with cascading mountains in the backdrop. Tunnels and Ke’e beach are at the very end of the road, and we mean the very end of the road. Stunning views of the Na Pali Coast can be seen from Ke’e which boasts sunsets year-round. *Please note that do to the substantial flooding and landslides that occurred in April, Ha'ena and Ke'e are temporarily unavailable for commercial use. It is unclear when these locations will be reopened to the public. We are sorry for the inconvenience.